On Thursday, November 8th, from 1 to 2 PM Eastern, popular progressive Air America host and author, Thom Hartmann, will host a 9/11 truth debate between Kevin Ryan, 9/11 UL whistleblower and co-editor of the online “Journal of 911 Studies,” and Michael Shermer, publisher of “Skeptic Magazine” and Executive Director of the Skeptics Society. Click here to Listen Live at the time of the show. Kevin Ryan is former Site Manager for Environmental Health Laboratories, a division of Underwriters Laboratories (UL). Mr. Ryan, a Chemist and laboratory manager, was fired by UL in 2004 for publicly questioning the report being drafted by the National Institute of Standards and Technology (NIST) on their World Trade Center investigation. In the intervening period, Ryan has completed additional research while his original questions, which have become increasingly important over time, remain unanswered by UL or NIST. Michael Shermer is the Founding Publisher of Skeptic magazine and the Executive Director of the Skeptics Society. He is an author, speaker, and producer. Dr. Shermer is a contributing editor and monthly columnist for Scientific American, and is the host of the Skeptics Distinguished Lecture Series at Caltech. He is also the co-host and producer of the Fox Family television series, Exploring the Unknown, and serves as the science correspondent for KPCC radio, an NPR affiliate for Southern California. A good review article is at Scientific American’s Smear Against 9/11 Truth–A Critique of “Fahrenheit 2777: 9/11 has generated the mother of all conspiracy theories”. From ThomHartmann.com–Thom Hartmann is live daily from noon-3 PM ET in New York, Los Angeles, San Francisco, Detroit, Seattle, Denver, Portland, Phoenix, Santa Fe, San Diego, Pittsburgh, Memphis, Grand Rapids, and on over fifty other stations nationwide including Chicago, Washington DC, Santa Barbara, Minneapolis, and on XM and Sirius Satellite radio. He is also a four-time Project Censored-award-winning, New York Times best-selling author. His national daily progressive radio talk show, now in its fifth year on the air, replaced Al Franken on the Air America Radio Network and now has more live daily listeners than any other progressive talk radio show. 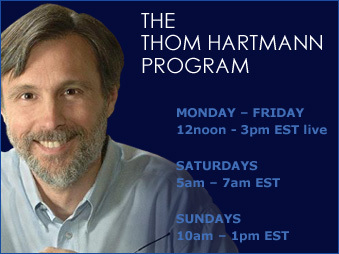 Click here for Thom Hartmann’s blog and here for the show archives. Here are links to Listen Live, and for Live Chat.